A rough day on the 10th with a strong SW wind and showers blowing through; the recent spell of easterlies still exerted their influence though as the day’s highlight was a lovely, tiny, streaky LANCEOLATED WARBLER caught by hand in rough grass at Sandar, ringed, admired and released at the Obs where it typically ran away like a mouse and rapidly disappeared – only the fifth for the island! Other birds dug out on the land included the Greenish Warbler still at Dennishill, 2 Common Rosefinches together at Phisligar, 2 Kestrels, 5 Sand Martins, a Rock Pipit, a Black Redstart, a Garden Warbler, 3 Willow Warblers, 2 Spotted Flycatchers and a Pied Flycatcher. Also of note were 8 Red-throated Divers, 6 Herons, 2 Pintail and 2 Ruff. An even rougher day on the 11th with a blazing strong SW wind and more showers so new arrivals were at a premium but did include a Grasshopper Warbler by the lighthouse – the overdue first of the year, a House Martin in off the sea at the north end – only the second of the autumn and a little arrival of 39 Wheatears. Lingering birds comprised the Buff-breasted Sandpiper still on Brides Loch, the Greenish Warbler still, a Barred Warbler at Brigg, 2 Kestrels, single Ruff and Whimbrel, a Short-eared Owl, 3 Rock Pipits, a Whitethroat and 2 Willow Warblers. We are now in the time that birds are going to move despite the weather not just because of it as with the strong westerly airflow still in charge on the 12th there were still some new arrivals noted with a Corncrake flushed from docks at Longar – the first of the autumn and second of the year, a juvenile Stonechat at the Obs, 2 Bramblings at Holland and the overdue first Lapland Bunting of the autumn on The Links. Other birds seen which were most likely lingering individuals included the Greenish Warbler again, 2 Barred Warblers (Obs and Holland House), a Yellow-browed Warbler at the surgery, 2 Kestrels, 2 Ruff, the Black Redstart, 4 Willow Warblers and a Pied Flycatcher while the lochs held 73 Wigeon and 4 Pintail. Last year's prices have been held for 2019 so book now for accommodation at the Bird Observatory. Various options are available from the comfortable Guest House, to the self-catering Hostel and also Camping. Don't miss out on your chance to explore a unique part of Orkney and experience top quality North Ronaldsay birding in 2019. Click HERE for prices. 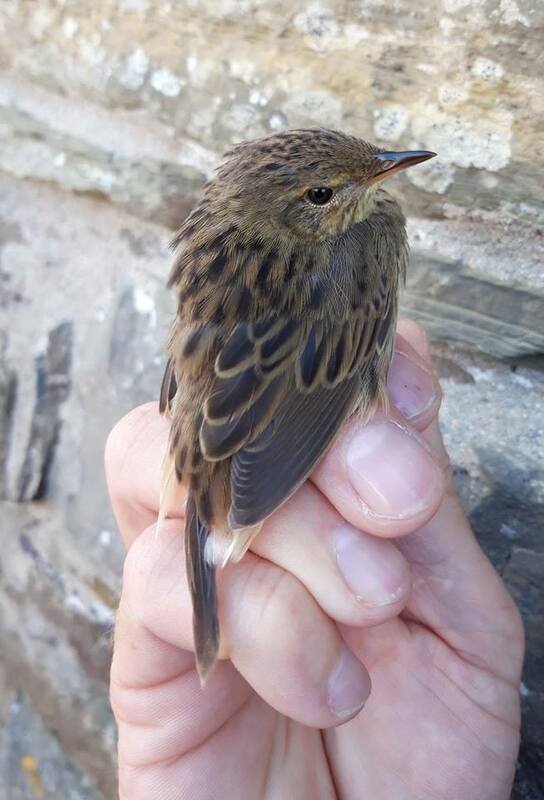 NRBO was established in 1987 to study and record the migrant birds that pass through Orkney's most northerly island each year. The number and variety of birds that arrive here on migration in Spring and Autumn can be spectacular, and North Ronaldsay is well-known as one of the best birdwatching sites in the country. The observatory also provides comfortable accommodation for visitors to the island.